That’s a fast 3D print! When swimmers want to swim fast, they make their swimsuits emulate shark skin, so when Belgian Group T wanted to make their race car go fast, they did the same thing with its body, only they printed it. 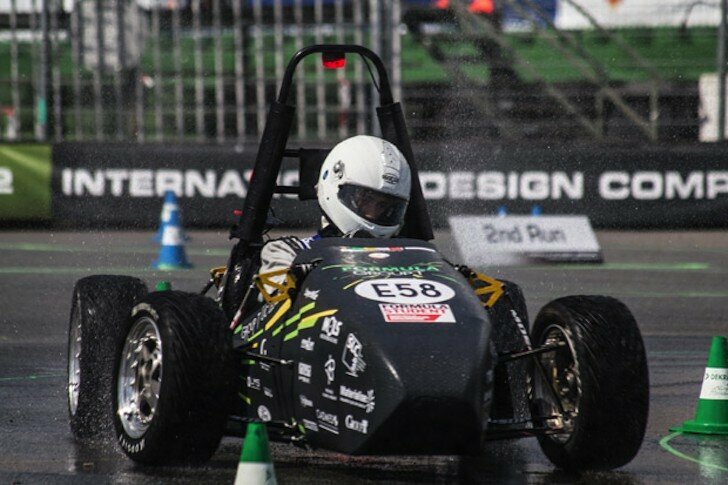 The car is called Areion, named accordingly after the mythologically swift and immortal horse, and is one of dozens of high-tech cars entered into the Formula Student Competition. This is a unique competition where the cars are rated both on and off of the track, and Areion impresses in every regard. Instead of just racing their creations and seeing whose is fastest, the teams must also pitch their cars as viable business plans to judges that are acting as would-be investors. What that means is that the car needs to be a marketable item that’s profitable, so it must be produced in a repeatable manner that’s cost effective, and it must win races. Easy enough, right? Group T made wanted to make the point that the use of leading-edge technology could save money and increase performance simultaneously, and 3D printing serves as a big point maker here. They decided to print several parts of the car, including the entirety of the plastic body, which is one solid piece with clips and brackets built in to reduce the number of components and total weight. The sides of the body were specifically designed to force air over a radiator on one side, and separate water and particulates from the air stream on the other. Few companies can deliver such large, intricate single prints, but it was nothing for the Materialise Mammoth SL (Stereolithography), which can output objects over seven feet in length. Only three weeks were needed to produce the whole body. Group T also went to Sirris for their specialized Electron Beam Melting technology to produce custom uprights for their suspension system; combined with being made from titanium, a mico lattice structure allows the uprights to be light and sturdy, which means better handling and less wear. Sirris was also involved in fabricating the biocomposite seat, bringing another green element to the car (and its presentation). Besides the print jobs, the Areion is also equipped with an electric drive train. So what does all this technology get you? The Areion weighs a measly 617 pounds, will shoot from 0 to 60 mph in 3.2 seconds, top out at a time-traveling 88 mph, and is totally electric (did I forget to mention that?). Fitted with an 85 kW motor that’s powered by lithium-ion batteries, the Group T team wanted their car to be lean, mean, green, and super clean. Considering they’re already winning awards, I think they’re on the right track.